Okay...so I'm trying to catch up with all the race results and reports. This post will include weeks June 27th through July 5th. June 27-28. This weekend saw a bunch of shorter course races, including Cohassett and Holliston. We had a huge BTT turnout at Cohassett (tent series next year?) with 7 members racing, and 4 podium finishes. BTT was led by Jamie Strain (1st AG, 4th OA), Ali Winslow (3rd AG, 71st OA), Nancy Arena (3rd AG, 109 OA), and Lauren Cullings (3rd OA, 112 OA)....is it me or is Lauren making a strong case for ROY (rookie of the year)? Better step it up newbies!!!! Chris Lawton and Mark "who's your daddy" Pelletier represented the Blue and Green in Holliston, with Chris taking 3rd in his AG and 17th OA. Also competing this weekend were Scott Stavely (placing 2nd in his AG) at the North Country Triathlon and Stephen Wall (placing 1st in his AG) at the Vermont Sun Triathlon. Many podium finishes....great job!!! July 4-5. Not as many races to report this weekend....but some impressive results nonetheless, with Mat "dude where's my bike" Davenport placing 7th overall at the Fingerlakes Fifty (yes...that's 50 miles....of running). Joe Kurtz representing BTT up at the Killington International Triathlon, as he preps for LP. Joe took 3rd in his AG and 8th overall at the very small, but extremely competitive race. And, Pat Dwyer finished 4th overall at the Minuteman Classic 5 mile run. BTT Powerbar Swim Clinic. 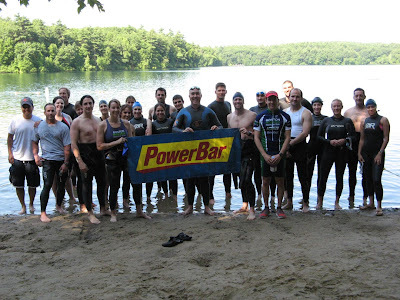 A big thanks goes out to Jen Scalise-Marinofsky and Joe Kurtz for organizing and hosting the Powerbar Swim Clinic at Walden Pond. We had a great turnout....of BTTers and friends of BTT. Lastly, after recieving some tough love in the last blog post, Rookie Mike Williams posted his results on the BTT website....so we can finally publish his race report! Escape from Alcatraz should be on the top of everyone’s list. It’s more of an adventure or destination race versus a PR opportunity. This was definitely the coolest Tri I’ve ever done. 1.5 mile (or so) swim in from Alcatraz after jumping off a ferry. 18 mile bike through hills (and descents) of Presidio. 8 mile run including a 400-step sand ladder on Baker Beach. It’s a difficult race to get into – I’ve tried the lottery for the past couple years without any luck. I snagged a totally last minute entry through a friend of mine that lives out there. It came with the obligation to “host” a couple elite athletes that thankfully she helped coordinate! 1. Take time on the swim to soak in the views. I stopped a few times just to look back at Alcatraz, Golden Gate and then take in the SF skyline. I probably could have taken a more aggressive route with the currents and had a faster swim time, but not worth the risk of “missing” the exit point. 2. Rent a bike out there. The course is very hilly. I felt great climbing, but got smoked on the downhills (and also witnessed a couple wipe-outs). You don’t have many flats to earn time back so just soak up the surprise views that are unveiled every few minutes. 3. Run hard! I found myself lolly-gagging around on the run for the first 4 miles before realizing I only had 4 miles left. Crush the sand ladder with all you have and don’t worry about burning all your matches. You only have 3 or so miles left after it. 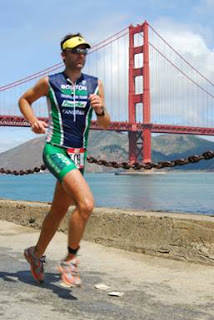 Shout out to teammate Jay Higginbottom who was in SF for the weekend and led BTT cheering on the finish line stretch – was a great boost of adrenaline for the last hundred yards! So, yeah, I caved and bought the “official” photos. Couldn’t resist the Golden Gate bridge. Great job everyone! 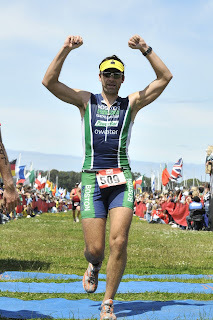 Lot's to report next post, including IM Switzerland and IM Rhode Island 70.3! Also, a big shout out to those racing IMUSA...Lake Placid: Joe Kurtz, Mike Williams, Amy Robinson, Janice Biederman, Meghan Kilroy and Evan Israelson (sorry if I missed anyone)!!!!! Good luck guys!